Southern Institute of Technology (SIT) is pleased to announce an accommodation bursary for students eligible for the Government’s Fees Free policy that comes into effect on 01 January 2018. His worship, Mayor of Invercargill Tim Shadbolt having supported this initiative from the onset has now consolidated his backing by lending his name to the bursary. Eligibility criteria for the Mayor Tim Shadbolt Accommodation Bursaries for Invercargill will reflect that of the Government’s Fees Free policy. To check your eligibility for the Fees Free Policy please check here http://www.feesfree.govt.nz. SIT can confirm that eligible students, in addition to getting their first year of tertiary studies for free, will also be able to apply for free shared accommodation at SIT’s apartments in Invercargill for the academic year (40 weeks’ maximum). Alternatively, eligible students at our Invercargill campus can opt to receive a $100/week accommodation bursary regardless of whether they live at home or in rental accommodation. Again, this will be offered for the academic year, for up to 40 weeks’ maximum. What happens next after I have registered my interest with SIT for the Mayor Tim Shadbolt Accommodation Bursaries for Invercargill? SIT will send out an application form to those who have registered an interest to apply for the Accommodation Bursaries. These forms need to be completed and sent back to us. Further details and instructions will be made available with the application form. Alternatively you can download a copy of the application form above. Will someone studying through SIT2LRN but living in Invercargill be eligible for the Bursaries? No, you must be a full-time student studying a course offered as face to face delivery at SIT’s campus in Invercargill to be eligible for the Bursary. 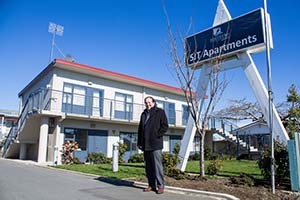 Yes, if you live in Southland, are eligible for the Government fees-free initiative and you are attending SIT’s campus in Invercargill as a full-time student, you can apply for the Mayor Tim Shadbolt Accommodation Bursaries for Invercargill. We will consider applications from Youth Guarantee students attending the Invercargill campus. Can I get studylink assistance as well? As a student, it is your responsibility to advise StudyLink that you are receiving the Accommodation Bursary. What should I do if I Withdraw, Transfer programmes or take a Leave of Absence? If a student fails to attend classes, or is otherwise withdrawn/transfers programmes or takes a leave of absence from the class, payments will stop and any overpayments will be sought from the student. What happens if TEC changes a student's Fees Free eligibility status on the Fees Free website (www.feesfree.govt.nz)? The Accommodation Bursary payments will stop. How long will I get the Accommodation Bursary payments? The Accommodation Bursary will be paid for the duration (up to 40 weeks) of your current Enrolment Contract. If you Enrolment Contract is for one semester only, you will need to re-apply for the Accommodation Bursary for any further Enrolment Contracts. When will payments start and when do I get paid? Payments will be initiated after the Accommodation Bursary form is received, the Fees Free website shows as eligible and you as the student have signed the correct Enrolment Contract. Payments will be made the month after you have started your study around the 20th of each month for the number of days studied in the month. For example if your programme starts on 15th February you will be paid on 20th March for 15th to 28th February. If your form is received during your study period, payments will start the month after your eligibility has been confirmed (no back payments will be made). To download a copy of the Mayor Tim Shadbolt Accommodation Bursary for Invercargill application form, click here.